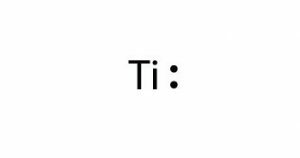 Titanium (pronunciation: ti-TAY-nee-em) is a hard, shiny, strong, and lightweight element classified as a transition metal and represented by the chemical symbol Ti [1, 2, 3]. As compared to the other ferromagnetic elements, titanium is a weakly magnetic metal that shows its magnetic characteristics in the presence of external magnetic fields . 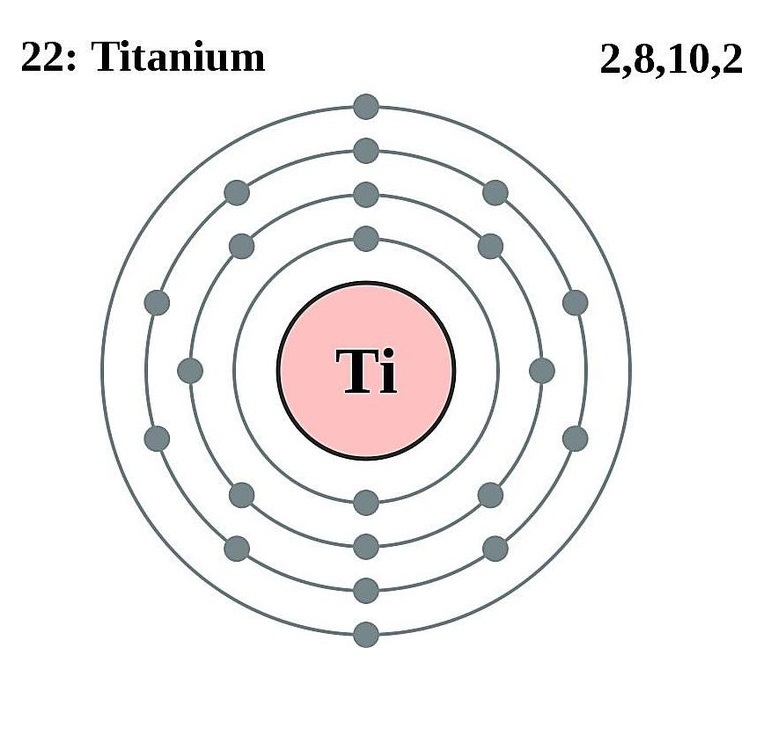 There are five stable naturally-occurring isotopes of titanium, including Titanium-46, Titanium-47, Titanium-48, Titanium-49, and Titanium-50, with Titanium-48 having the greatest natural abundance of 73.8% . 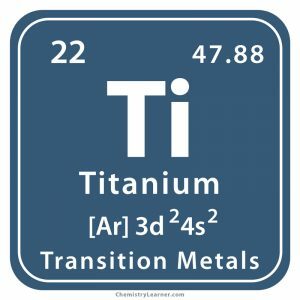 Titanium is characterized by 21 radioisotopes out of which the most stable are Titanium-44, Titanium-45, Titanium-51, and Titanium-52 with half-lives of 60 years, 184.8 minutes, 5.76 minutes, and 1.7 minutes respectively . 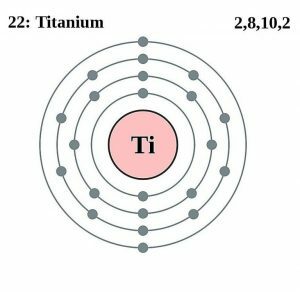 As the 9th most abundant element in the Earth’s crust, titanium is commonly found in igneous rocks and their sediments . It is present in minerals like rutile (titanium dioxide), ilmenite (titanium-iron oxide), and sphene (calcium titanium nesosilicate), as well as in titanate (titanium oxide) and several iron ores . It is commercially extracted from its ore through reduction of titanium (IV) chloride using either sodium or magnesium . Titanium (IV) oxide is obtained from ilmenite by using either chlorine (chloride process) or sulfuric acid (sulfate process) . The top 3 titanium producers are Canada, Australia, and South Africa while the top 3 titanium reserve holding countries include China, Australia, and India . Origin of its Name: The name is derived from the word ‘Titan’, which in Greek mythology means “the sons of the Goddess Earth” [1, 2]. 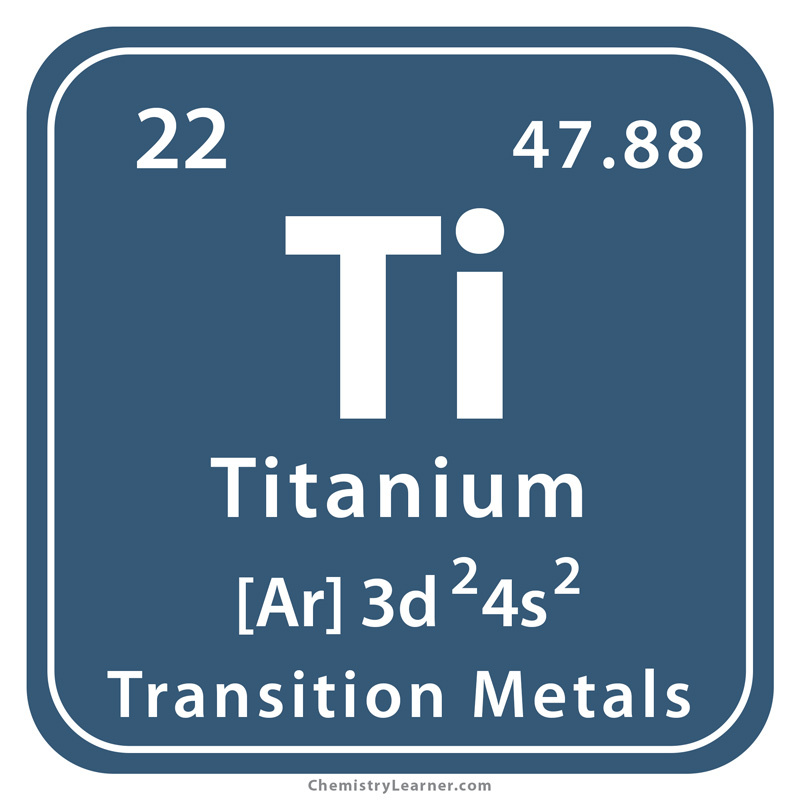 Who discovered it: Titanium was found by the British mineralogist and clergyman William Gregor . In 1791, the titanium mineral menaccanite was found in Cornwall by William Gregor . He studied it and inferred that it consisted of iron oxide along with a new metal, which he reported to the Royal Geological Society . The German chemist Martin Heinrich Klaproth, in 1795, analyzed a red mineral ore called Schörl . It was the oxide of an unknown element which Klaproth named titanium . After learning about Gregor’s discovery, Klaproth examined menaccanite and confirmed that it was made up of titanium . M.A. Hunter, the metallurgist from New Zealand, produced pure titanium metal from titanium tetrachloride and sodium metal in 1910 . Titanium forms important alloys with other metals, including molybdenum, iron, and aluminum, that are used in missiles, aircraft, and spacecraft due to their low density and high-temperature resistance [1, 8]. Although it is as strong as steel, it has a much lesser density because of which it is commonly used in laptops, golf clubs, crutches, and bicycles [1, 8]. Since they resist corrosion, titanium pipes are used in power plant condensers . As it has excellent corrosion resistance in seawater, it is widely used for propeller shafts, hulls of ships, submarines, and in desalination plants [1, 8]. Titanium has many surgical applications, including its use in hip joint replacements and tooth implants [1, 8]. Since its pigment has great covering power, it is used in plastics, artists’ paint, house paint, enamels, and paper . It is used in solar observatories because of its excellent infrared-radiation reflective properties . Titanium oxide is an essential ingredient in sunscreens, used for protecting the skin from UV light . While pure titanium is considered non-toxic, exposure to large amounts of titanium dioxide dust may be hazardous . Although the safety of nano-TiO2 is unclear, studies have shown that it may damage the liver, kidney, brain, and lung functions when it is inhaled or taken in high doses . It can also be toxic to embryos in development . 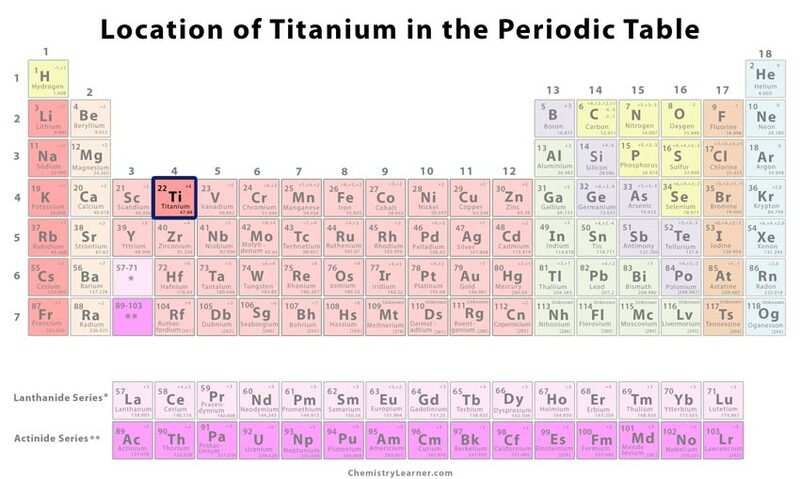 Titanium is not known to play any biological role . Every igneous rock (that is formed due to the cooling and solidification of lava) consists of titanium . According to Boeing, the 737 Dreamliner comprises 15 percent titanium . A 2011-satellite-image revealed titanium-rich rocks on the moon’s surface . The graphical representation of titanium indicates an early votive statue based on the Titans in Greek mythology . 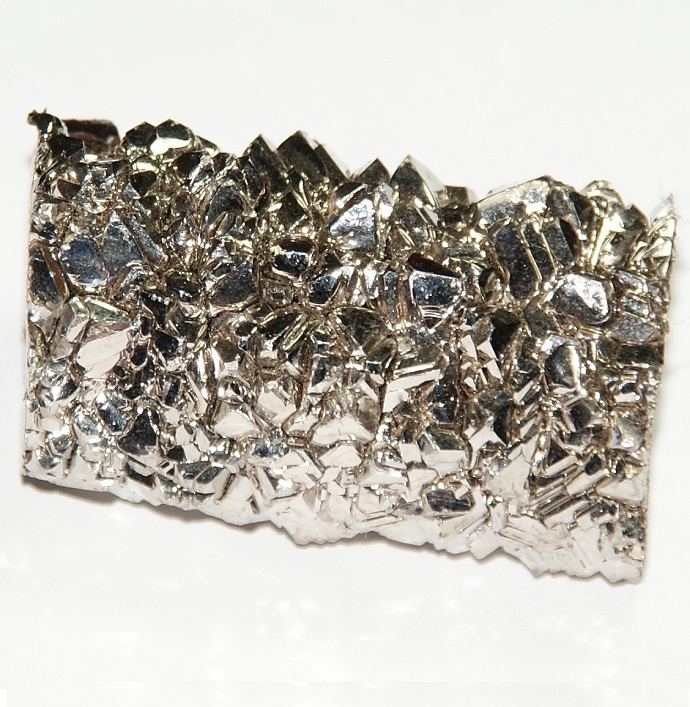 The cost of pure titanium is about $6.61 per gram .